Many times during the day you receive an important SMS or a call that you completely miss until you check your phone to make a call or something like that on a whim and notice that message. While it is harmless and doesn’t really matter, sometimes, it so happens that the call or SMS you miss is of importance and can cost you. Most of the times this happens when you don’t have any LED notification light to remind you that you have a ‘missed’ notification or something. Nevertheless, the fact remains, that it is quite important for many to keep a tag on the notifications that you receive. Who knows, it could change your life. Prof Reminder is a missed call and SMS/MMS notification reminder. Simply put, if you miss any or somehow ignore them, this application will remind you and it can definitely come in handy if you do not have a notification LED. The application supports different profiles so you can literally set how you want to be reminded whether it is by sound, vibration of the phones, the screen lighting up or your camera flash blinking. The application will only remind you about SMS/MMS and missed calls so if you are expecting you will be reminded of e-mails and Facebook notifications, well that is not going to happen. There is a night mode that you can activate for when you are sleeping. 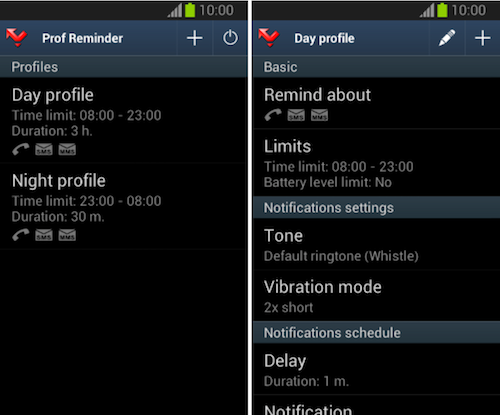 You can set how many times that reminder activates, by setting repeat intervals and repeat counts. You have the ability to set different reminders for SMS and MMS and, e-mails. If your phone is on silent you can set the reminders to be silent as well. The best part is that you can choose to ignore reminders for calls that are very short (they may be accidental). If one is on a call, it will not remind you during so not to cause any disturbance. There are no advertisements and no unnecessary permissions required. The size of the application is really small and the memory consumption is low as well. The application is available for free and is compatible with Android OS 2.1 and higher with four different languages supported. All in all, this is a well thought up application; it does the job and runs smoothly. There are many options included in order to make this application very convenient and it might just save you a lot of trouble. Give it a shot and let us know what you think.